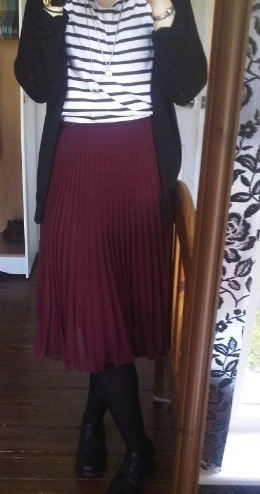 In the words of Lizzy, Viva La Gran because this skirt really does conjure up a bit of the OAP action! I wonder what my cat item in April will be, a black sheer shirt, a Peter Pan tunic or maybe some floral harems for summer...? Oddly it's never struck me as particularly grannyish. I think it's probably because of the funky way everyone has styled it and the beautiful colour - it doesn't look like your typical old lady polyester pleated skirt. I'm obsessed with pleated skirts. Im dying for a black pleated mini! Love the colour of this skirt but could never wear it! They just dont suit me! However you guys all look stunning. Hey look, it's me! Thanks very much for the mention :). I know what you mean about the unpopularity of this skirt though - there are still loads in the stores that I've been into. Seems a shame, it's going to be great for summer :). This is a great idea for a blog post! I love this skirt, I really want it. I'm a bit worried about wearing it with flat shoes though. Good inspiration for how to wear it though! Do you know what? I really don't mind people copycating somethng of me, sure it means they like my style no? Plus, I probably got 'inspired' (that's what it's called in 'legal' terms) as well by someone far more awesome than I such as emma watson or someone like that :P good feature, and make the next one bright pink brogues.. though i haven't seen anyone wear it yet on blogs. What a great idea! I do like this skirt, although I'd probably rather get one from a charity shop - the colour is great though! 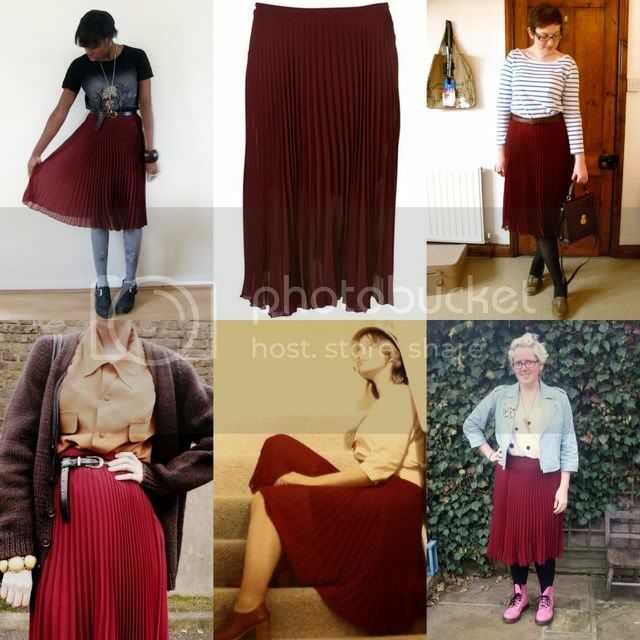 I love these pleated skirts! Very cool idea for a feature. Very nice , I shall try..
Haha i like the new feature and its name because it is .. very apt? I can't blame everyone for liking the skirt. I love it too! I used to wear a pleated skirt like this for school (in blue) I wish I'd have kept it now, don't know it it'd still fit me.